We saw the theory in action during the Super Bowl commercials: more channels, more success. Several television Super Bowl ads wisely incorporated mobile apps, QR codes and links to Facebook and Twitter to try and reach consumers from all angles. Nowadays, while people are watching a basketball game on TV, they might be simultaneously tweeting about the score, texting their friends and playing games on their iPads. A report from Yahoo and Razorfish revealed that while watching TV, 66% of US mobile device owners multitasked on their laptop or desktop PC on a daily basis, and 49% used the web daily on their mobile phone while watching TV. With so much multitasking going on in the consumer world right now, there’s no guarantee you’ll reach your target audience with just one medium. This means brands need to reevaluate their multichannel marketing programs. A report from Nielson found that businesses engaging in multichannel marketing campaigns are most likely to see increased brand visibility. The report found that half of U.S. consumers exposed to a particular TV ad recalled viewing the advertisement, but upon being exposed to the ad across multiple screens (TV, computer, mobile phone and tablet), that percentage jumped to 74%. With the plethora of digital devices and channels, marketers should learn to successfully combine them in order to achieve maximum reach. Mobile devices are especially important to incorporate in the marketing mix as their global proliferation continues to rise. It’s the one device people have attached to them at all times—of course we need to consider using it to target consumers. Multichannel marketing requires combining the right channels to reach and engage consumers, so marketers need to find out which channels are worth integrating, and create one big digital marketing plan that encompasses all of them. A study by Wildfire Interactive found that social media tracking and measurement tools help companies determine benefits and value as well as promote client retention. While marketers look at the overall benefits of social media, they are also drilling deeper to determine the value of Facebook fans in particular. Among respondents to Wildfire’s survey, 44% said Facebook fans are valuable because they help with new customer recruitment. Additionally, 18% said Facebook fans have higher conversion rates and another 18% noted that they make more frequent purchases. Forrester Research recently published a study that forecasts interactive marketing spend over the next five years, showing differences by industry. Interactive marketing budgets are forecast to grow at a compound annual growth rate (CAGR) of 17% over the next five years, but not all industries will invest at the same pace, according to a new report by Forrester Research. 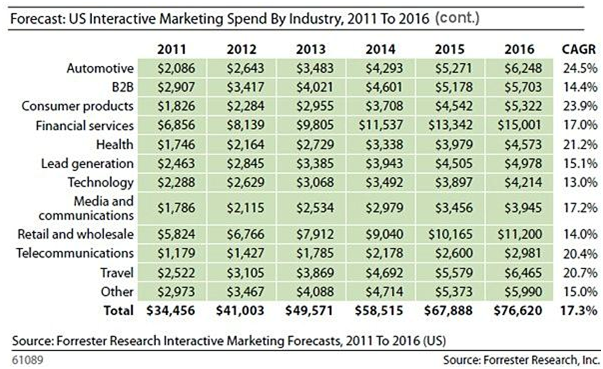 Overall, marketers across all industries are expected to spend nearly $77 billion, or 26% of all ad dollars, on interactive marketing by 2016. Companies in the financial services sector are expected to spend the most on interactive marketing, whereas automotive and consumer goods businesses will record the steepest growth over the five-year forecast period. B2B interactive marketing budgets are expected to remain relatively small and grow at lower rates through 2016. B2B interactive marketing (search marketing, display advertising, mobile marketing, email marketing, and social media) spending is expected to grow at a 14.4% CAGR, to 5.7 billion in 2016. Despite the relatively low growth, B2B is projected to boost mobile marketing investments, from $129 million in 2011, to $639 million in 2016—a 38% CAGR over the next five years. 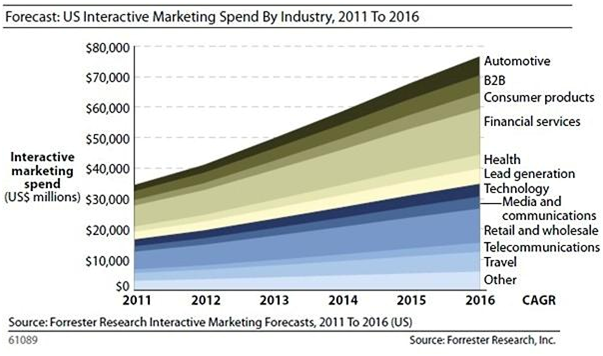 Financial Services is forecast to spend the most on interactive marketing, growing at a 17.0% CAGR over the next five years, to $15.0 billion by 2016. 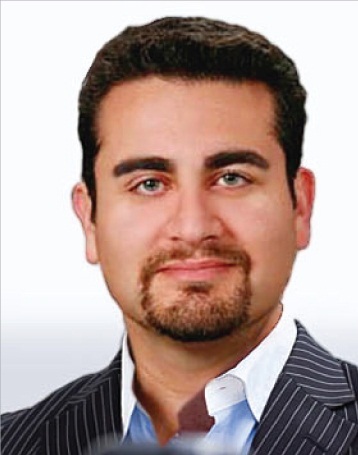 Technology interactive marketing is expected to grow at a 13.0% CAGR over the next five years, to $4.2 billion in 2016. Big offline spenders—the automotive, healthcare, and consumer goods industries—are projected to grow their interactive spend the most. For example, automotive interactive marketing is expected to grow at a 24.5% CAGR over the next five years, to $6.2 billion in 2016. Consumer goods interactive spending is forecast to hit $5.3 billion in five years, pacing at a 23.9% CAGR.